Sign in to access your subscriptions and subscriber-only content. Today real estate shoppers in Spain will find good-value properties at bargain prices in three scenic mountain towns—Mijas, Ojén and Torrox—located 30 minutes from the popular resort town of Marbella. With more than 2,800 hours of sunshine a year, this region attracts travellers and expats looking to escape a harsh winter back home and save money at the same time. “A couple can live well for about $2,400 a month, including $600 in rent,” reports InternationalLiving.com editor Nazareen Heazle. 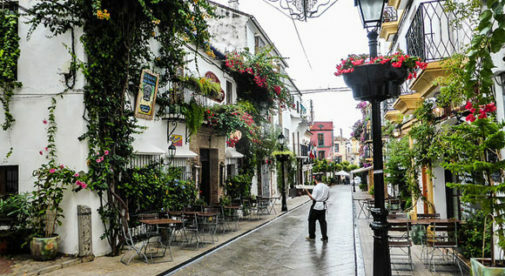 “You can own your own little piece of romantic Spain for less than $110,000. If you’re looking for a full- or part-time escape, complete with all the romance of the Old World, then look no further than Mijas and its sister mountain towns in Andalusia. “It’s no secret that Spain’s property market has been at rock-bottom the last few years, but it’s slowly starting to pick up in this area. Buyers, mostly from Western Europe, are making their way back to southern Spain. They are buying with a view to retiring to the area,” Heazle says. In the town of Mijas, a two-bedroom, one-bathroom apartment right in town recently listed for $107,950. The property is close to all the stores, and the apartment also has a private patio area, perfect for enjoying the year-round sun. Also in the center of town is a penthouse apartment with two bedrooms and a balcony, with views of the village and the sea in the distance, listed for $125,730. Nearby Ojén is another of Andalusia’s white towns and has a “real” Spanish-town feel to it. “It’s peaceful here in the mid-afternoon, as shops close for the traditional siesta. You’ll hear the clink of coffee cups coming from the tiny cafés, as the locals relax during the afternoon. An occasional car squeezes past on one of the slim, steep streets. The pace of life up here is slow and steady,” Heazle says. A two-bedroom, two-bathroom apartment in the upper town rents for $635 a month. With a terrace that boasts views of the village below and the Marbella coast in the distance, the apartment is also for sale, with an asking price of $203,200. Also in Ojén, a two-bedroom, one-bathroom apartment with a fully-fitted kitchen, marble floors in the living area, and underground parking lists for $111,760. Both Mijas and Ojén are close to the coast and the resort town of Marbella—a 30-minute drive away. A bustling town of around 140,000, Marbella has everything an expat could want…big-name grocery stores, a glut of restaurants and cafés, clothing stores from upscale Gucci to mainstream Zara, and a hospital. Real estate in Marbella is more expensive than up in the mountains. This is where the European élite decamp for their fix of fun in the sun. But it’s still affordable. Properties for sale start at around $176,530 for a one-bedroom, one-bathroom apartment about a 10-minute walk from the beach and promenade. “If you like the idea of living in one of these alluring mountain towns but want to be even closer to the beach, then Torrox ticks all these boxes. This peaceful pueblo is located 40 minutes east of Málaga and about an hour from Marbella. It’s also less than a 10-minute drive from the beach of Ferrara Playa. It offers great-value real estate, with townhouses from $101,600 and long-term rentals from as low as $480 a month,” reports Heazle. The full report on property bargains in southern Spain can be read here: Property Bargains in Southern Spain. Editor’s Note: Members of the media have full permission to reproduce the article linked above once credit is given to InternationalLiving.com. Photos are also available. Media Contact: For information about InternationalLiving.com content republishing, available source material or to book an interview for radio, TV or print with one of our experts, contact Associate Editor Carol Barron, 772-678-0287 (US), CBarron(at)InternationalLiving(dot)com or visit the Media Center. For automatic updates on the most current stories, follow International Living Media on Twitter. For more than 30 years, InternationalLiving.com has been the leading authority for anyone looking for global retirement or relocation opportunities. Through its monthly magazine and related e-letters, extensive website, podcasts, online bookstore, and events held around the world, InternationalLiving.com provides information and services to help its readers live better, travel farther, have more fun, save more money, and find better business opportunities when they expand their world beyond their own shores. InternationalLiving.com has more than 200 correspondents traveling the globe, investigating the best opportunities for travel, retirement, real estate, and investment.